Dr. Joan Taylor and Dr. Bill Wilmot secure a prize they've working toward for more than 30 years. It was a Triple Crown season in which all three winners had solid connections to Saratoga Springs and the Capital Region. Dr. Joan Taylor and Dr. Bill Wilmot did not come home to Saratoga with a trophy, yet they secured a precious prize they had been working toward for more than 30 years. Taylor and Wilmot, who met at Tufts University veterinary school and married after graduation, bred Belmont Stakes starter Twisted Tom at their Stepwise Farm on Fitch Road near Saratoga Lake. While they have produced many successful horses through the years, Twisted Tom was their first Triple Crown runner. Starting on the rail, he found plenty of trouble yet showed some grit and finished sixth in the field of 11. Taylor and Wilmot have delivered approximately 150 Thoroughbred foals at Stepwise Farm. Some have been sold for very nice prices at auction. A high percentage have been winners on the track and a good number have won stakes. Twisted Tom, a son of Creative Cause out of their broodmare Tiffany Twisted, twice failed to sell at auction because radiographs showed a sesamoid bone in one of his legs may be a problem. He was withdrawn from a third sale and was subsequently sold to Thomas Brockley for a bargain price in a private sale. Brockley promptly sold the horse after his second win to top trainer Chad Brown, a native of Mechanicville. Twisted Tom opened 2017 with three straight wins, two of them in stakes, bringing his proud breeders on a ride to the Belmont Stakes. Since Saratoga Springs is such an important part of the Thoroughbred racing business, it is quite common for there to be ties locally to the winners of important races in America as well as internationally. 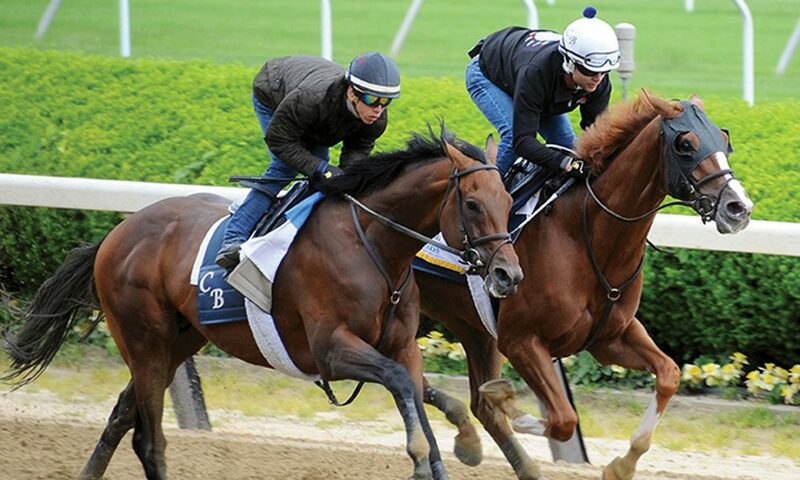 This year there are an extraordinary number of links to three Triple Crown winners. Saratoga Springs-based West Point Thoroughbreds owns a percentage of Kentucky Derby hero Always Dreaming. The West Point group includes former New York Racing Association track announcer Tom Durkin, who lives much of the year in Saratoga. Colonie native and Saratoga homeowner William Lawrence is the co-owner of Cloud Computing, whom Brown prepared for his victory in the Preakness. It was the first Triple Crown race win for Brown, already an established star at the age of 38. Among the owners of Belmont Stakes winner Tapwrit is Brian Spearman a graduate of Saratoga Central Catholic High School and a Saratoga homeowner. After spending most of the 1970s working on the track, and saddling 1975 Met Mile upset winner Gold and Myrrh, Wilmot enrolled in vet school in 1979. Two years later, he and Taylor purchased 200 acres of vacant land on Fitch Road that had once been part of a dairy farm. Their property is adjacent to McMahon Thoroughbreds, where 2003 Kentucky Derby and Preakness winner Funny Cide was foaled. Using that careful approach, Taylor and Wilmot have found success through the years. Twisted Tom, the horse no one wanted, delivered something quite special.